TechwareLabs has tested several different storage devices in the past ranging from NAS to external hard drives and flash drives to RAID. Consistently we continue to recommend flash drives for affordability and high portability. Today we are testing the Corsair Voyager drive weighing in at a whopping 32GB of storage. Corsair makes two versions of the Voyager, the standard Voyager and the Voyager GT which boasts a speed boost of up to 4x faster than average USB drives according to Corsair. We are testing the standard Voyager which is available in capacities ranging from 2GB to 32GB. The Voyager GT is available in 16GB only and is rated for faster transfer rates though we were unable to find specifications for this drive on their website. What can I do with 32GB? As you can see 32GB is a lot of space. 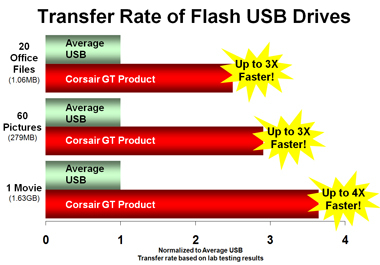 Unfortunately what we have traditionally run into with flash drives is the larger they get the slower they get. This leads to long loading time when transferring information to and from the drive. We hoped that the Voyager would not be prone to this problem, read on for our testing. The Corsair Voyager is an average size drive encased in durable rubber housing and are supposed to be water resistant. The graphics on their site show the drive being submerged in water. This may not be a realistic representation of what the drive can survive as it is not waterproof but water resistant. The cap does not seal out water entirely so if you attempt this and then attempt to plug the drive into a usb port you will likley encounter a short circuit. Let's move on to testing the Corsair Voyager.